As a co-operative owned by growers that has become one of Australia’s leading grain businesses, the CBH Group is unique in the agricultural industry. The Group owns and manages one of the most sophisticated grain storage and handling networks in the world. Its Operations division manages four ports and 197 grain receival points servicing Western Australian growers cultivating grain over more than 300,000 square kilometres. CBH uses IT effectively and innovatively. For example, its LoadNet for Growers which allows over 4,500 growers keep track of their grain within the CBH system. “Project Saturn’s aim was to bring contemporary IT to CBH’s network of almost 200 grain receival points across the State,” said CBH Project Manager, Sean Bullett. “New all-in-one PCs at every location would effectively function like ‘ATM kiosks’, providing access on a Windows 7 platform to the CBH network and Intranet via the Telstra Next G network so that details of each grower’s delivery quantity and quality sampling data could be entered at the point of grain receival. 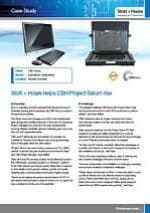 “The greatest challenge CBH faced with Project Saturn was the physical environment in which PCs would have to perform reliably,” said Sean Bullett. CBH’s extensive network of grain receival points means that many are located in remote, very dusty and often hot environments. Grain receival is seasonal, and the Project Saturn PC fleet needed to be easily and safely transported so it could be deployed on-site during harvest and removed for secure storage in a more IT-friendly environment when not required. “An all-in-one PC solution potentially offered the advantages of a smaller unit footprint on-site and for transport, and simpler onsite installation and set-up,” said Sean. “Due to the dusty operating conditions, ease of cleaning was also a further advantage of the all-in-one form factor. “However, transportation and installation in challenging operating environments remained considerable challenges. “Robby Meyer and the team at Stott Hoare were able to come up with an efficient and cost-effective solution incorporating Lenovo ThinkCentre M90z all-in-one PCs, unique Lenovo Extend Arms and custom-designed military grade transport cases that met CBH’s requirements perfectly,” said Sean. “The overriding factors in putting together a solution were secure transport, easy on-site installation, and reliability,” said Robby Meyer, Stott Hoare Senior Account Manager. CBH had previously utilised Lenovo PCs successfully, and were interested in exploring its all-in-one PC range. The professional-grade ThinkCentre M90z all-in-one saves space, energy, time and money. For CBH, combining the monitor with the central unit meant a smaller PC footprint onsite, and less cable clutter. The M90z PCs feature Intel® Core™ i series processors with Turbo Boost Technology, which scales power dynamically for optimal processing and energy efficiency. A further advantage for CBH was the ability to speed boot-up time to as fast as 35 seconds and shutdown time to just nine seconds. “The Lenovo Extend Arms were a brilliant addition to Stott Hoare’s solution,” said Robby. By mounting these securely on-site, and then simply attaching the all-in-one M90z PCs, it was easy to ensure the PCs were positioned in secure, pre-determined locations. The Extend Arm then let operators adjust the PC for comfortable use after they’d also plugged in a keyboard and mouse. “The Extend Arms were a great innovation,” said Sean Bullett. “Because they were pre-installed on site, there was always a dedicated place for the M90z PCs to go that was optimal for that worksite. It took away the concern that although the PCs may get to site safely, they could end up being installed in an inappropriate location and potentially damaged. Power quality was also a concern at some locations, so CBH installed Uninterruptible Power Supplies (UPS). The remaining challenge for Robby and the Stott Hoare team was secure transport. After considerable research, Robby was able to organise the manufacture of customised moulded plastic cases. “The cases are military-grade,” said Robby. “They’re moisture proof, shockproof and dustproof and we also fitted custom foam interiors to accommodate each M90z PC, mouse, keyboard and cables. “Stott Hoare had successfully tendered for CBH’s ICT supply in late 2011. However, the demands of Project Saturn were both unusual and challenging,” said Sean Bullett. “We’ve been very pleased with the way Stott Hoare enthusiastically accepted the project’s challenges and came up with solutions that were workable, reliable and cost-effective. “It was attractive that they could provide a complete package that included the Lenovo M90z all-in-ones,the Extend Arm accessories, the extremely rugged transport cases, and a comprehensive 3-year warranty and support service. “CBH is a great client to work with, and our team really enjoyed the unique challenges of Project Saturn,” said Robby Meyer. “It illustrates one of Stott Hoare’s greatest strengths – our ability to really listen to our clients and get a full appreciation of their unique needs. ‘In the case of Project Saturn, many of the grain receival points in smaller and more remote areas are really little more than dusty sheds. “It’s a less than ideal environment for state-of-the-art IT, however, the M90z all-in-ones are really proving why Lenovo has such a strong and longstanding reputation for rugged reliability. “Project Saturn has been a very interesting project to work on, and we were pleased Stott Hoare could once again deliver a complete, practical all encompassing solution at a competitive cost,” concluded Robby.